Start typing the neighborhood you'd like to receive market data from, then select the appropriate one from the dropdown. 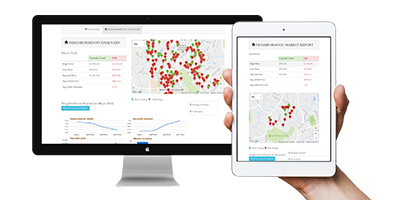 In an instant you'll receive your Neighborhood Market Report filled with recent data that's updated daily. See the Average Home Prices, Highest Price Listed and Lowest Price Listed, Highest Price Sold and Lowest Price Sold, as well as Seller Discount and Current Listings in the neighborhood. If you like what you see, be sure to sign up for the bi-monthly email reports to stay up-to-date on all the current trends in your selected neighborhood.